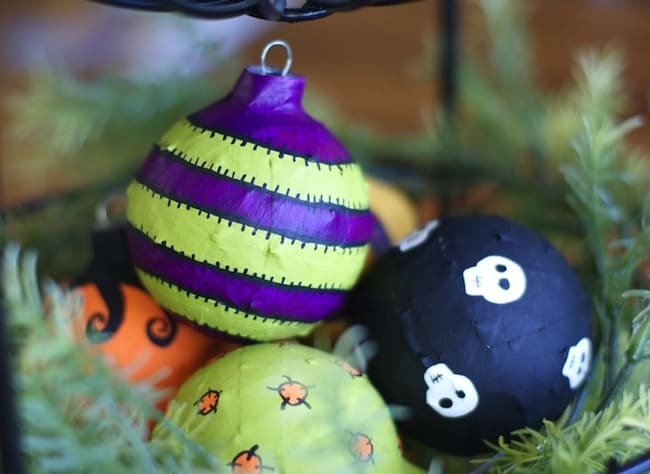 In this budget friendly, recycled Halloween craft, you'll use Mod Podge and old Christmas ornaments to make these cool Halloween ornaments! Hey Mod Podgers! 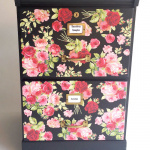 I'm Becca from Blue Cricket Design and I'm super happy to be here today! 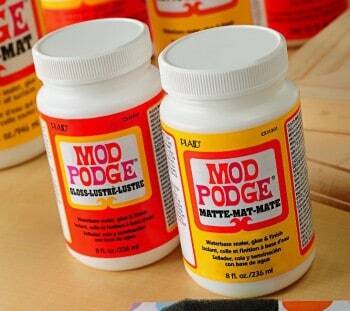 Mod Podge definitely Rocks but not nearly as much as Amy and her awesome blog. Both are two of my favorites!!! I'm thrilled to be able to come and play and show off my MP skills. 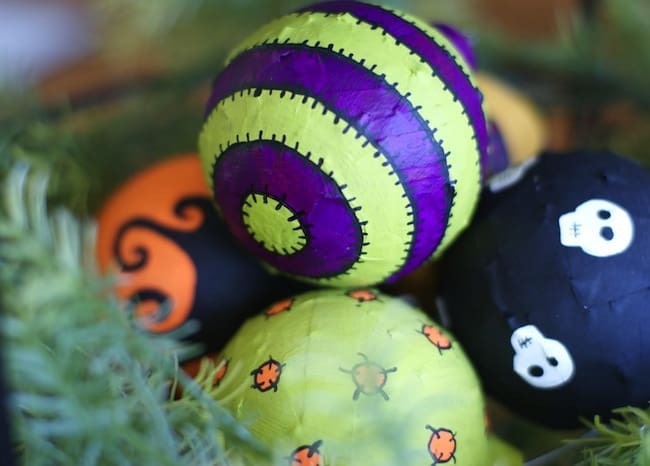 Are you guys ready for a little recycled Halloween craft fun? Introducing . 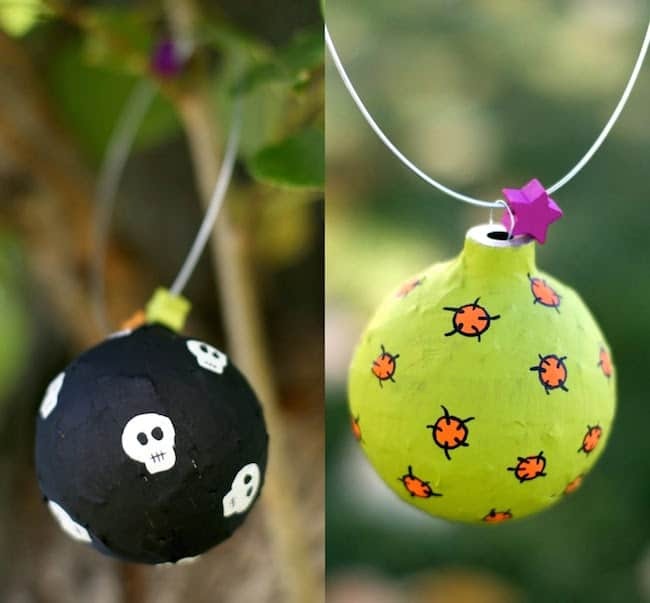 . . Halloween Ornaments!!! For sure!! Some whimsical painting and Halloween colors make these little guys spookerific. Here's the “How To” low down . . .
Those glass ornaments I'm sure you can find in your Christmas stash. If you need to go get some check your thrift stores first! I picked up a 24 pack for 50 cents. SCORE! 2. Take newspaper and rip it into thin strips. If you rip from the top of the page to the bottom, it rips super smooth and even. HINT: The thinner the strips, the smoother the paper will lay. Strips should be about 1/4″- 1/2″ thick. 3. 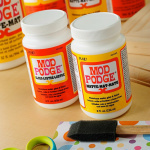 Mix one part water with one part Mod Podge! Enough to submerge your paper in. 4. Dip each strip into the MP mixture being sure to get it completely wet. Using your fingers, wipe off excess mixture. 5. 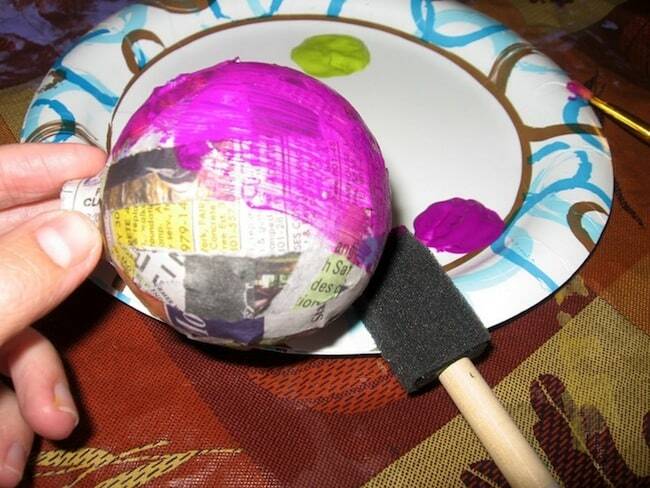 Start wrapping the wet paper strips onto the ornaments. 6. Continue wrapping paper strips and be sure to get the lip of the bulb that holds the top hanging thing. 7. 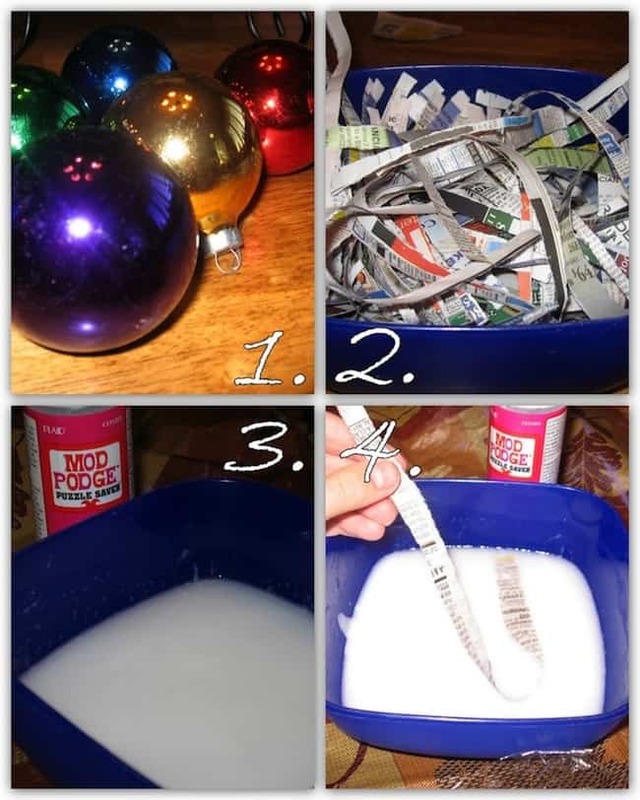 Cover all of your ornaments completely. 8. Hang them to dry overnight. Once they are completely dried you can start to get crazy and paint your heart out! 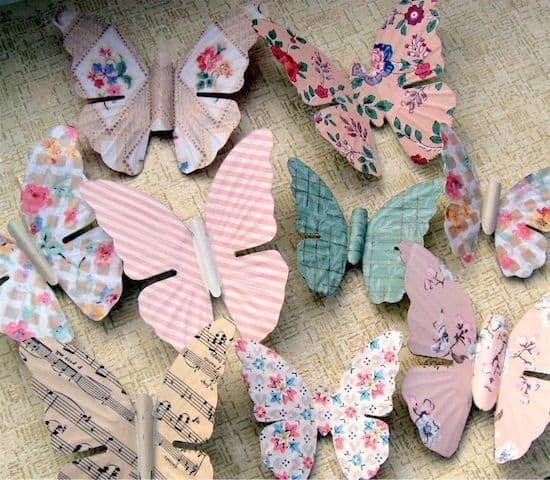 Get creative with your designs and patterns. Add glitter and gems to add sparkle or cut out Halloween images from scrapbook paper and decoupage them on! The possibilities are endless. Add wire and beads if you plan on hanging them. I have my Halloween ornaments hanging on door knobs and cupboard knobs throughout my house. 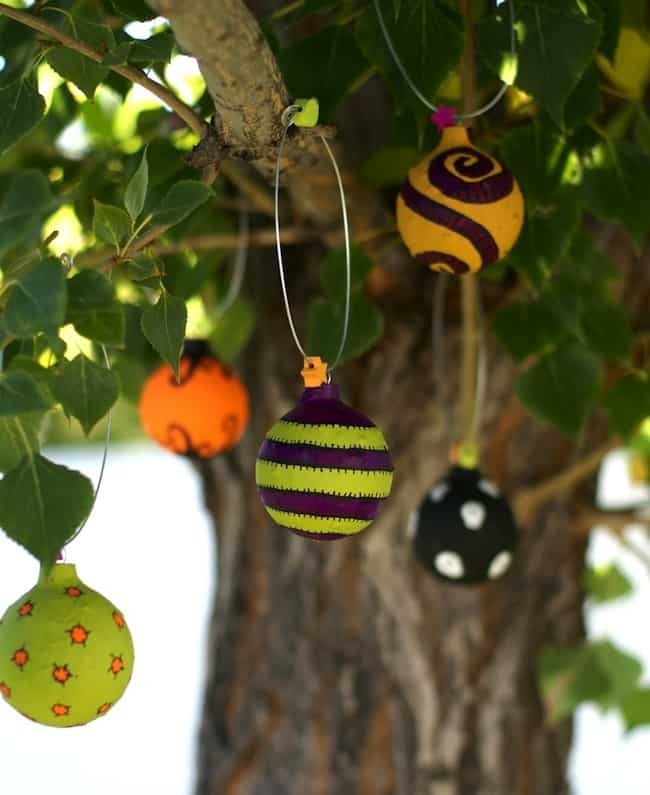 You could also display your Halloween ornaments in a bowl or basket or jar just as they are. Thanks for letting me share. Amy, you're the best! those are so stinkin fabulous! 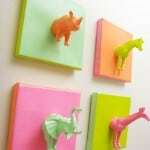 Those are adorable!!!! Such a great idea! Those are adorable!!! The wheels are turning – so many possibilities! cute! I made a halloween garland and wreath (that I got the idea for from you) and those would’ve been great to add on…may still be a possibility. Those are amazing! I love the colors & designs! Nice job Becks- once again you amaze me with your ideas! I am now hooked…I can see endless ideas with these! Love it….I have to do this! Verra cool! So simple, yet so versatile! I love Halloween ornaments! And these are going to be a hoot to make! 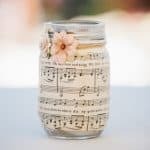 What a fun idea, these are gorgeous! I’ll be linking. Thanks everyone, for the comments! Didn’t Becca do such a great job?!? those are cute. 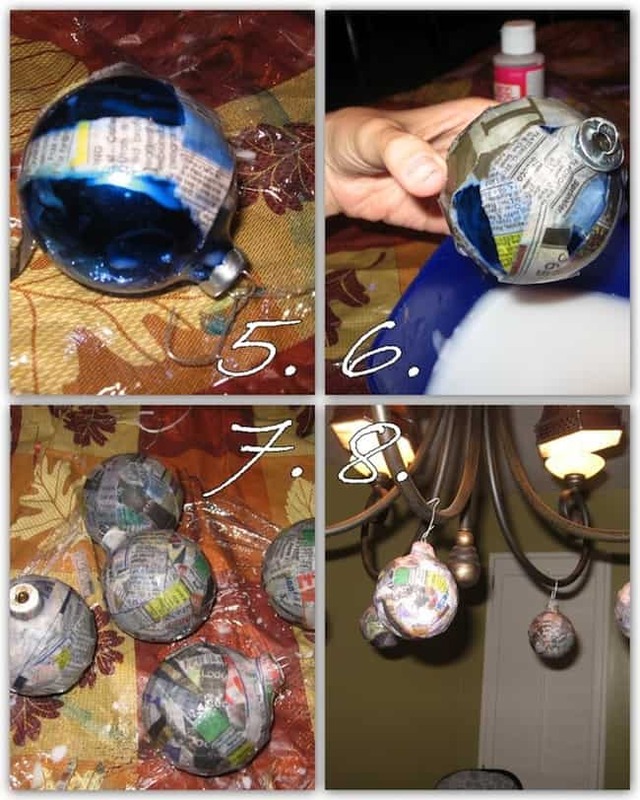 I love making Christmas ornaments and I can see me making these and painting them for Christmas.You could paint them a solid color then paint a person’s name on them and date it, too. ok, these look awesome. I’m definitely trying this.